No. 4 Abgor Close Off Osolo way. Silver Grandeur Hotel is a 3-Star hotel located at 4, Agbor Close, Isolo Way, Lagos, Nigeria. It is just about 4.6km from the Murtala Mohammed International Airport. Silver Grandeur Hotel has 38 spacious rooms. The room categories: Studio, Deluxe(Queen), Superior (Chief), and Business Deluxe. 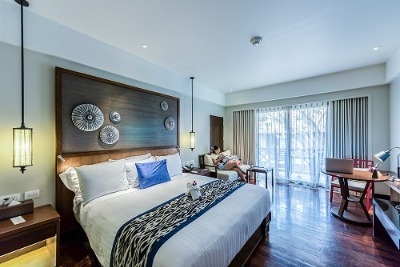 The rooms are spacious and stylishly decorated; contains an individually controlled air-conditioner, refrigerator, a work desk, a safe security box, a 32-inch flat screen TV, and en-suite bathrooms. Daily complimentary breakfast is offered. There is a host of facilities available in Silver Grandeur Hotel. Some of them are: CCTV cameras for optimum security, a well-equipped conference room for corporate events, and free Wi-Fi. It has an admirable bush-bar for relaxation. The bush bar also has space suitable for holding events and weddings at attractive prices. Corporate guards and armed policemen are available for 24 hours within and around the premises. Silver Grandeur has impressive meeting rooms that have the capacity to accommodate 150 guests, and these meeting rooms have natural lighting. On request, the hotel provides high-speed internet access, audiovisual resources and other required event facilities for these meeting rooms. They all have cost implications. The hotel provides extra services on requests like: car hire, airport shuttle, 24hrs room service, concierge service and laundry/dry cleaning service. They make provisions for safety deposit boxes to ensure the safety of items. They also have a business centre, which makes working online easier for guests. Payment: Cash and card payments (Visa or Verve). Please note that reservations made via card prepayment cannot be refunded. Q: Does Silver Grandeur Hotel offer free Wi-Fi? A: Yes, free Wi-Fi is available in each of the room categories. Q: Does Silver Grandeur Hotel have a swimming pool? A: No, it doesn't have a swimming pool. Q: Does Silver Grandeur Hotel offer complimentary breakfast? A: Yes, it offers complimentary breakfast for each room. Q: Is there a fitness centre/gym at Silver Grandeur Hotel? A: No, a fitness centre/gym is not available. Q: Does Silver Grandeur Hotel have a restaurant? A: Yes, it has a restaurant with different delicacies. Q: Does Silver Grandeur Hotel have onsite parking? Is it free? A: Yes, it is free to park inside the hotel. Q: Does Silver Grandeur Hotel offer airport pickup or shuttle services? Q: Does Silver Grandeur Hotel allow smoking in rooms? Q: Does Silver Grandeur Hotel have an event centre/conference rooms? A: Yes, it has a conference room. Q: Does Silver Grandeur Hotel accept cash, cheques, cards and bank transfers? Q: What is the check in and check out time at Silver Grandeur Hotel? Q: Does Silver Grandeur Hotel have hair dryers? Silver Grandeur Hotel is a budget hotel in Ajao Estate, Lagos. Payment: Cash, Card (Visa or Verve). The experience I had in the hotel was superb, the room was very big with a king size bed that I really enjoyed sleeping on. The meal they served was very nice and I had multiple options to choose from. The environment was very quiet and clean. It is really a beautiful place. The environment is calm and peaceful. The Business Deluxe is very spacious and neat, the hotel is well secured and the hotel's attendants are very caring and helpful. My stay at the hotel was very good and am really impressed in all. The customer service was great, the environment and room was very clean and tidy too. My stay at the hotel went very well. I had a nice stay. The customer services was great. The environment was well cleaned. The room I stayed in was cool and cozy. The bed was very comfortable and had clean sheets. The bathroom was well cleaned by the house keeper. The food there is really good. Good hotel. Have nice pictures of Silver Grandeur Hotel?